Did you know that the iconic beauty brand and celebrity favourite Palmer’s, is celebrating its 175th Anniversary this year and that Palmer’s Cocoa Butter Formula Range with 100% Pure Cocoa Butter & Vitamin E, is also turning 40 years old? Well you do now and are you surprised to find that it is as popular today as it was in 1975 when it first launched. 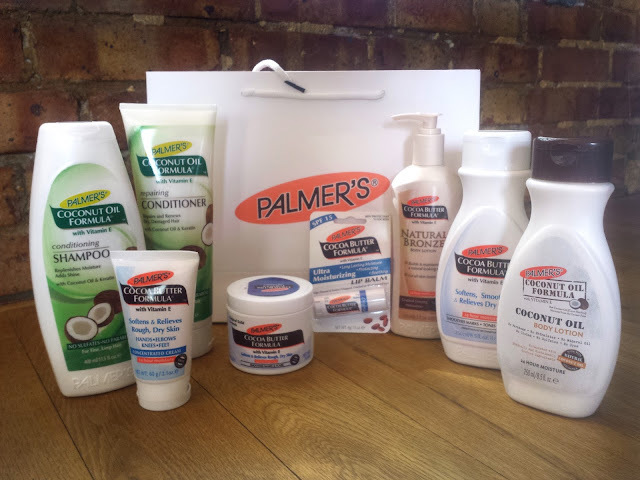 Palmer’s has also achieved over 100 Beauty Awards over the past decade (over 40 of these are for the cult favourite Palmer’s Cocoa Butter Formula Lotion) and now has a global presence in over 110 countries. Palmer’s is the Original Cocoa Butter Brand for super soft silky skin, I first came across it in my teens when I was given a tub to use by a cousin of mine who said the scent reminded her of Caramac Bars. With its rich and creamy formula carefully blended using the richest, 100% natural Cocoa Butter, high quality cocoa beans and Vitamin E, Palmer’s is a trusted brand with proven heritage in relieving numerous skin conditions including dry skin, stretch marks and scars. Naturally packed with antioxidants, Palmer’s Cocoa Butter Formula provides 24 Hour Moisture and the creamy emollient, fast absorbing formula will make you feel touchably soft, smooth and special. To win, all you have to do is use the Rafflecopter widget below. The giveaway is open for one week and a winner will be chosen at random next Monday. There are some mandatory entries which must be completed in order for your entry not to be disqualified (and I do check). As always please ensure you are over 16 years of age or have your parents permission to enter because I will need your address. This is also a UK Only competition- Good Luck! I absolutely love Palmers stuff and have a massive collection so no entry in the comp for me. My fav is cocoa butter - lord I practically drench myself with this stuff. Great post and good luck everyone! I have been looking at the Palmers range for a while now and just discovered their scar removing range. I have everything crossed! I love Palmers products, they make my skin lovely and soft. And they smell good too - extra bonus! I love palmers so would love to win! I love trying products that I never tried before and these look lovely. I want to win because I'm a newbie to Palmers and love their products! I recently ran out of the conditioning shampoo and need another! This is BRILLIANT! I use Palmer's every morning!! I first started using Palmers products when I was recovering from major surgery. I believed that the cocoa butter really helped all my scarring heal. I always use Palmers for after sun when I go on holiday. But to be honest I am lazy when it comes to daily body lotion so I don't use it as often a I should. Palmers cocoa stretch marks 'fighter' saved my skin when I was pregnant for the first time. I know it's all about the routine, and consistency, but I also know the nice smell and texture, and ingredients included in their product did their job nicely. I have very dry skin and need all the help I can get! I need some good skincare products! Would love to give it ago due to having alot of problems with my skin. Gotta stay moisturised! Also these are great products! I would love to win as the products look great and would be perfect for my skin! would love to try the shampoo out looks fab! Because my skin is really dry and itchy! I'd love the coconut oil body lotion! I love palmers products, they do a great job - and they smell amazing!